Keep it rustic or renovate it! If you have ever dreamed of a lake home renovation, this could be your chance. Come by and envision the possibilities of making that come true. You’ve watched the shows on HGTV – you’ve pinned ideas on Pinterest – but you have never found a home to try on Lake Martin…until now! This 3 bedroom 2 bath home is on a private, shady waterfront lot in the popular Pleasure Point / Paces Point part of the Blue Creek area on Lake Martin. 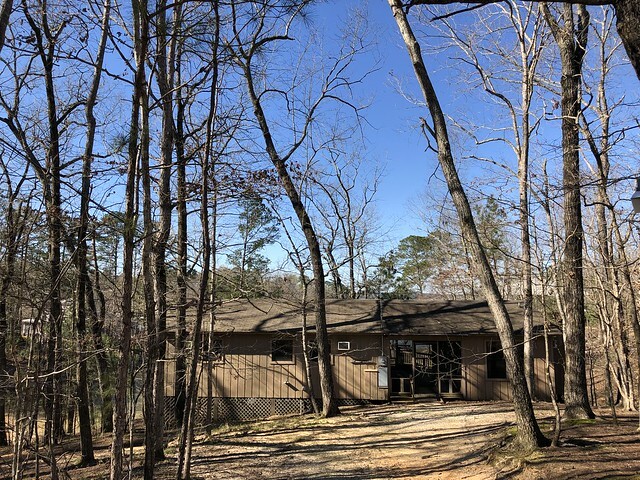 It has great bones, easy steps to the water, great privacy and view, and a huge dock with two covered boat lifts so you can enjoy the water immediately! Your cabin in the woods! This is a fully wooded lot with a long driveway that makes you feel like you’re getting away from it all. By land you are close to Lake Martin Pizza and Oskar’s Cafe and being in the center of the Lake you are close to Chuck’s Marina and Pizzeria! Easily visit your friends on the north side of the lake from 422 Pleasure Point.